Whenever I am asked my age, I cringe a little. I usually reply with 'guess' or just say I am mid-to-late thirties, not completely accepting the fact that soon I am going to have to tick the next ‘age bracket’ box section that starts heading towards the next decade category. (Eeeeppp!). I do not feel the age I am ‘supposed to be’. Nor do I look my age. I can be drinking cocktails out of a kid's bucket at a pool in Thailand on Christmas Day with 25 year olds, frolicking through tulip fields in Amsterdam or having a Sangria fight in Spain and there is no age barrier. By age definition, I am meant to be settled down, having kids, buying my own home and have a car. I have none of the above and I can honestly say it doesn't bother me. Sure, it would be great to meet someone who wants to enjoy life with me, who I have a real connection with and who wants to travel and go on adventures together. Someone who makes even going to the supermarket fun! And yes, it would be nice to have my own place and a car, and I am sure it will happen one day; however I am no millionaire (and unfortunately haven’t won the lottery yet), so at this time of my life, I would rather save my hard-earned dollars to travel whilst I'm still fit enough and able to without any commitments. To meet new people and see new places all whilst enriching me as a person. Growing and learning. Experience over things. The flip side to this, is that when I am not in NZ or Australia, I can now only travel on a tourist or volunteer visa. I am deemed ‘too old’ for any further working holiday visas due to age eligibility. I do not have a certificate in a skilled job for the migrant visa and no dual-citizenship passports to travel on, so those paths are closed too. If only the working holiday age limit went to 45 – I know a lot of people in their late-30’s who are not tied to anything and would love to still have that opportunity to go somewhere to experience working and living overseas. Some of the most interesting stories I’ve heard have come from travellers who don’t have a ‘set life plan’ and who are also some of the happiest people I have met. Although they may have nicknamed me ‘Grandma’ at only 29, I wouldn’t change a thing by deciding to go work at that little ski-field in Manitoba, Canada a bit later in the piece. One of the best things I’ve ever done. It broadened my mind to other possibilities out there in the world – other people, cultures, history and more stories to take in. One great meme that I have seen and agree with is: “ I regret travelling, said no-one ever”. I have accepted that some of my oldest of friendships have faded – more so when you are single and the last few years have consisted of multiple friends getting married, having kids and lives changing. I am very happy for them and will always have time for them, however I also have to accept that things are different. Times have changed and that is okay. You just have to keep doing what is best for you, whatever that might be. 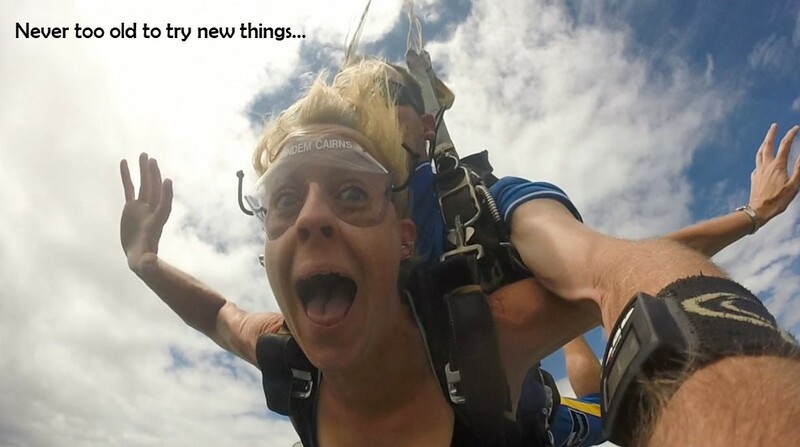 I probably won’t be drinking out of kids play buckets or jumping out of any planes in 20 year’s time, but I do hope to continue to travel for more years to come. There is so much more of the world to see, quality experiences to have and people to meet. I hope others aren't held back from doing what they want to in life just because of a number.